There are thoroughfares that are simply designed for a carefree stroll, where time or purpose are of no consequence. The art of strolling, the Danish translation, at slendre evokes images of casually strolling with a folded newspaper clasped between arm and body and someone dear holding the other, sharing the moment. 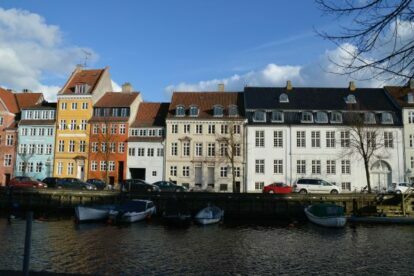 Copenhagen has such a thoroughfare, Overgaden Oven Vandet and Overgaden Neden Vandet runs exactly 1 kilometer, from north to south, a vital nerve in the city’s oldest neighborhood, Christianshavn. If there ever was a thoroughfare that captures Copenhagen’ s DNA then it is Overgaden Oven Vandet. A parade of colorful facades, many of them dating from the 1700s are home to a mix of residential, cafés, bakeries, stores and the odd artisan wonder. On the opposite side of the street, the main canal dominates and on a windy day bobbing masts only heighten the atmosphere in this wonderful neighborhood. Take your time and explore the gems tucked away here, from the craftsmanship of the book binder Karla K, one of the few remaining in Copenhagen to the handcrafted jewelry of Hilbert. Join the queue in Lagekagehuset and dribble over their countless cakes or head further north to the locals favorite, Parterre, a café that oozes personality, smells of home-made breads and has the best flat whites in town. Enjoy your stroll.